Abstract: Human language has no close parallels in other systems of animal communication. Yet it is an important part of the cultural adaptation that serves to make humans an exceedingly successful species. Evolutionary scholars have have converged on the idea that the cultural and innate aspects of language were tightly linked in a process of gene-culture coevolution. They differ widely about the details of the process, particularly over the division of labor between genes and culture in the coevolutionary process. Why is language restricted to humans given that communication seems to be so useful? A plausible answer is that language is part of human cooperation. Why did the coevolutionary process come to rest leaving impressive cultural diversity in human languages? A plausible answer is that language diversity functions to limit communication between people who cannot freely trust one another or where even truthful communications from others would result in maladaptive behavior on the part of listeners. 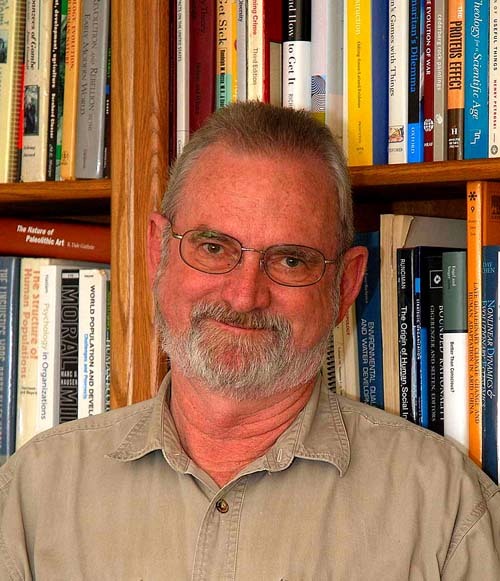 Pete Richerson‘s primary research for many years has focused on the phenomena of cultural transmission of information and the evolutionary phenomena that derive from cultural transmission. He has been especially interested in the trade-offs involved in using other people as a source of information. Even if we imagine that the cultural system of humans has been adaptively optimized by natural selection, maladaptive cultural variants can still evolve. People cannot take advantage of normally adaptive rules like “imitate the successful” without incurring the risk that the appearance of success is a sham behind which lurks a culturally transmissible pathology. Prof. Richerson has investigated such processes with mathematical models, laboratory experiments, and most recently field investigations. Abstract: A growing body of theory has begun to analyse human culture – the body of beliefs, skills, knowledge, customs, attitudes and norms that is transmitted from individual to individual via social learning – as a Darwinian evolutionary process. Just as the biological evolution of species can be characterised as a Darwinian process of variation, selection and inheritance, so too culture exhibits these basic Darwinian properties. I will present the results of a series of experiments that have simulated cultural evolution in the lab using methods from social psychology. One set of studies using the “transmission chain method” have identified a bias in cultural evolution for information concerning social interactions over non-social interactions, as predicted by the “social brain” theory of human intelligence. Another set of studies have simulated the cultural evolution of prehistoric arrowhead designs, testing hypotheses that different patterns of arrowhead variation are caused by different ways in which arrowhead designs were transmitted between prehistoric hunter-gatherers. Alex Mesoudi is Reader of Psychology at Queen Mary College, University of London. He is a psychologist who studies cultural evolution as a Darwinian evolutionary process, similar in key respects to the evolution of biological species. Culture can consequently be studied using similar methods, concepts and tools that biologists use to study biological (gene-based) evolution. My own research uses a combination of laboratory experiments and theoretical models to simulate the processes of cultural evolution, with the aim of identifying the small-scale, individual-level cultural processes that generate the patterns and trends that are observed in human culture. Abstract: Parents often spend considerable energy in teaching children their own beliefs, a behavior that has both economical and cultural underpinnings. I will present an economic analysis that predicts that minority groups spend more effort in teaching their children, and I will apply it to empirical data on marriage patterns. The analysis predicts that individuals from smaller groups most often choose to marry within their own group, and spend more resources in transmitting their beliefs to offspring. Alberto Bisin is Professor in the Department of Economics at NYU. He is an economist interested in the interaction between cultural and socio-economic forces, expanding economic theory that has traditionally explained human behavior as determined by cost-benefit analyses independent of one’s cultural background.